Hummingbird food sold in the stores is not really quality feed for our sweet little friends. First, hummingbirds don’t need to eat red food dye! Not to mention that most of the store-bought hummingbird feed is old and not the best option for these beautiful birds. We can do better and save ourselves some money to boot! My grandmother loved hummingbirds. There was always a hummingbird feeder on her patio filled with bright red liquid. I was fascinated with these tiny little creatures, and I still am. I am happy to share what I’ve learned about hummingbirds and hummingbird food with you. Hummingbirds can weigh anywhere from .07 – .7 ounces. There are over 300 species of hummingbirds worldwide and 16 in the United States. They don’t just eat nectar, they also eat small insects. Are you putting out hummingbird food but not hummers are feeding? Here are a few tips to attracting hummingbirds to your home and garden. In addition to feed offering a shallow area for bathing, preferably with moving water or a mist. Be consistent with your hummingbird food, nesting materials and bathing water. Hummingbirds will return to areas they know these things are available. Always use quality cane sugar in your hummingbird food recipes. Never use artificial sweetners or honey! Use clean water – filtered water is your best bet. Keep your hummingbird feeder clean by washing it thoroughly with a light detergent before you refill with fresh nectar. Never top-off your feeders. If your feeder is dishwasher safe it is good to run it through a cycle once a month. Put fresh hummingbird food / necar in your feeders every 5 days. If your temps are higher than 90 degrees F you’ll want to change it every 3 days. If you live in a cold climate you probably won’t need to offer hummingbird food during the late fall and winter because hummingbirds will migrate. Choose a feeder where the feeder ports are above the liquid. This will make it less attractive to bees and roaches because they cannot reach the liquid. Try to keep your feeder in a spot that is shady. This will help the hummers and keep your nectar from getting too hot. Keep your feeders at least 4 feet off the ground and make sure predators will not be able to access it or the birds. Getting the biggest hummingbird feeder isn’t necessary. If you’re finding most of the hummingbird food is left at cleaning times you may need to put in less food. If the hummingbird food begins to look cloudy or you see mold of any kind, you need to empty the feeder and make new nectar immediately. Remember if the feeder is attracting too many bees you can change this hummingbird food recipe to 5 cups of water, instead of the 4 cups called for in the original. Remove the water from the heat and add the pure cane sugar. Stir the mixture until the sugar is completely dissolved. Let the mixture completely cool before adding to your feeder. 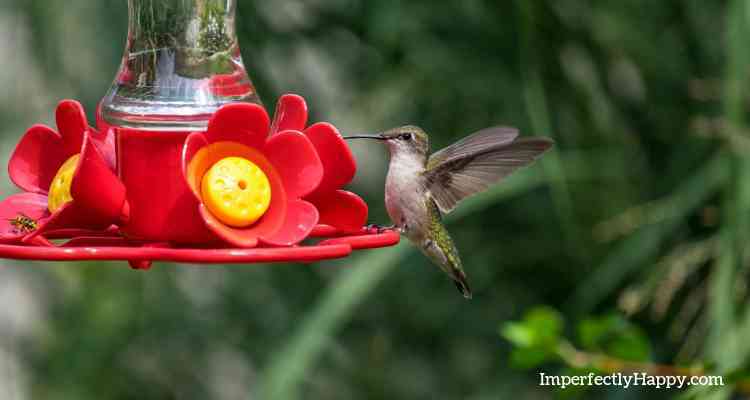 Follow the tips for hanging your hummingbird feeder and attracting hummingbirds to your home. Here are a few books I’d recommend for learning more about hummingbirds and hummingbird food. There is so much joy in learning about these sweet little birds for yourself. If you’re a homeschool family you may want to consider doing a hummingbird unit study for a great science study! Or try your hand at a DIY Hummingbird feeder. This fills more than one average humminggbird feeder wisch is great if you have several. if you only have one though i woul half the recipe.